A common writing class exercise is to provide a phrase or image and ask the students to weave a story around it. Bruce Judisch unwittingly participated in just such an experiment. Years ago, while witnessing the fall of the Berlin Wall, he observed a man standing in the crowd holding a hand-lettered sign with only one word on it — Katia. This moment was indelibly burned into his memory and over the years he found himself revisiting it and wondering …speculating. In his first foray outside the Biblical fiction genre, about a year ago Bruce Judisch gathered up those what-ifs and sat down at his computer to weave them into a story. The result is an emotionally compelling novel populated with a trio of unforgettable characters. Katia, it turns out, is the name of an East German woman who, though crippled by childhood polio, faces life with undaunted courage and an unshakable faith inherited from her clergyman father. Katia’s faithful friend and facilitator, Oskar, is a man with a murky past that he takes great pains to conceal. And last, but certainly not least, there’s the irrepressible Maddy, an American student they engage to transcribe Katia’s memoirs. As the story unfolds Maddy learns much about Katia, but even more about herself. 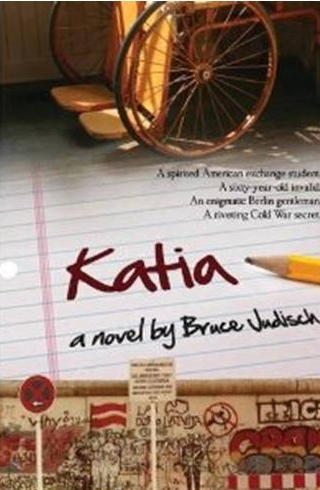 Told jointly by Maddy and Katia, Bruce Judisch’s well-crafted fiction moves effortlessly between past and present. Unlike some novels, with Katia there are no loose ends or blind allies. His meticulous plotting wastes nothing; seemingly insignificant characters and random events are drawn together into a thoroughly satisfying conclusion. You won’t find any better reading enjoyment than Katia provides. It’s the type of novel that you race through and put down with a happy sigh…and a silent wish it hadn’t ended quite so soon. It has the feel of a breakout novel. Read it today and join me in speculating about who will play Katia, Maddy and Oskar in the movie version.